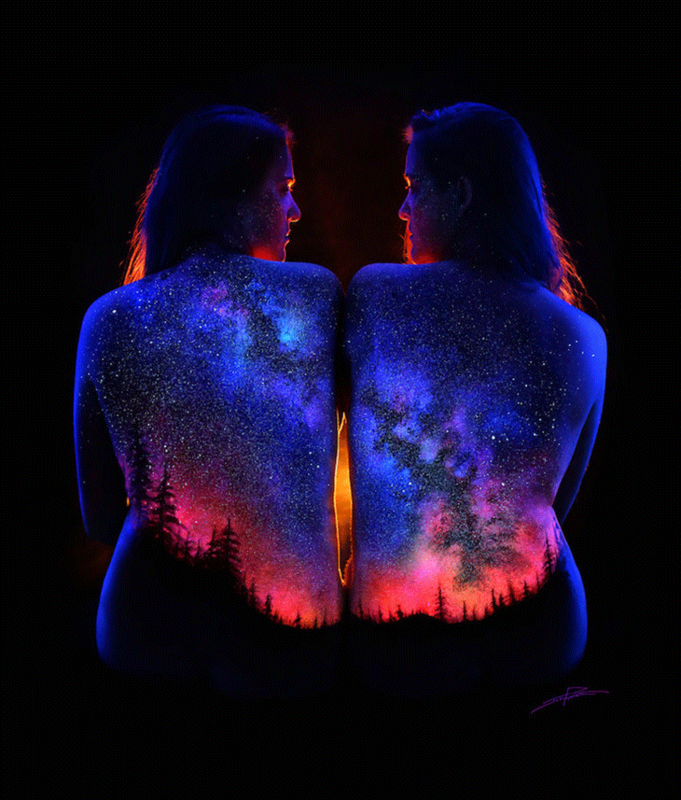 Photographer and artist John Poppleton specializes in creating spectacular works of art painted directly on the human body.John was born and raised in the surburbs of Sacramento,CA. He was introduced to photography during high school in 1988.He pursued all areas of photography passionately as a hobby and became a professional portrait photographer in 1993. John’s personal goal was to create something original and to be different but fantasy portraits were never part of his plan. In 2010, while suffering from a sleepless night in a hotel room bed, John received his inspiration for using black light and he was off on what has become the biggest adventure of his career. His Black Light Bodyscapes consists of the beauty of female form combined with gorgeous nature scenes . The fluorescent pigments are painted on the backs of the female models, who are then photographed under black light to produce these extraordinary images. Featuring spectacular phenomena such as oceans during sunset, mountain ranges under moonlight, shimmering auroras, and even cosmic scenes of stars and galaxies, the body paintings are all stunning to behold. The illuminating effect provides a surreal, fantastical vision of beautiful worlds that are full of life and depth. John blended these landscapes with incredible skill, blurring the line between the model and the fantasy world. With each picture depicting a scene displaying mother nature in all its rawness, the use of bodypaint seems to be the perfect choice. In some paintings, the canvas is stretched beyond the back of the model, often extending to face, arms, legs, and feet. In others, Poppleton even uses two female bodies to create one painting, with the landscape transitioning seamlessly from one woman to the other. In one bodyscape, the artist even uses the model’s hair as the beginning of a waterfall, her luminescent strands flowing smoothly into the white torrents of water. Blending elegance and grandeur, the fluorescent paintings embody the exquisite beauty of the universe. Also see: Taisia Sidorova, Develops Artistic Talent After Losing Half Of Brain. These pictures have even earned him a feature in Rangefinder magazine .To see more of his work ,head over to his Facebook page and YouTube channel. You can also browse through his entire portfolio — black light and otherwise — on his main website here.